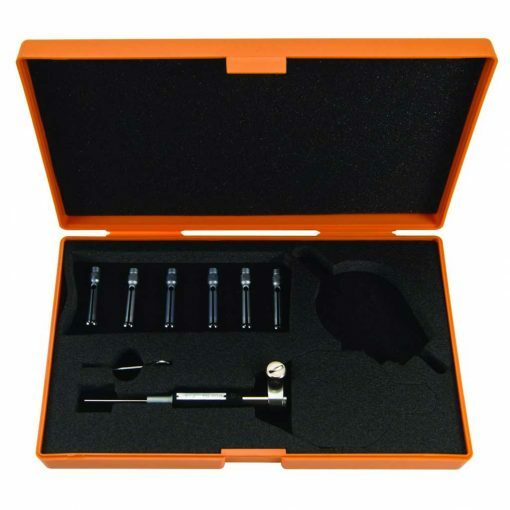 Mitutoyo Bore Gages Series 526 series for Extra Small Holes. These Mitutoyo Dial Bore Gages measure diameters of small holes. The radial displacement of split-ball contact is converted to axial displacement of measuring rod, which is shown on the dial indicator. • Measures diameters of small holes. • Radius displacement of split-ball contact is converted to axial displacement of measuring pin, which is shown on the dial indicator. • Digimatic Indicator can be installed in place of the dial indicator. • Optional stand (215-120) for Bore Gages Series 526 is available for efficient measurement of multiple small holes.